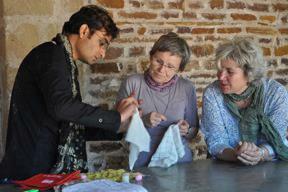 Grab this chance at learning embroidery the Gujarati way! Learn how the colorful handicrafts and textiles of Kutch express their rich cultural heritage. Join the Kala Raksha workshop for hands on experience. Visit artisans to see them living their art. Discover precious art in local textile museums and explore local villages. Textiles of Gujarat with Workshop takes you on an artisan journey to a less frequently visited region of incredible India. Partial proceeds go to Kala Raksha, a grassroots social enterprise for preserving traditional arts in Gujarat. You will be met at the airport by our representative outside of ground transportation after clearing customs and driven to your hotel. The rest of your day is free to relax from your flight or explore as you wish or a half day tour can be arranged for you. Mumbai (Bombay) is the vibrant and pulsating capital of Maharashtra. For over a century, Mumbai has been a commercial and industrial centre of India with a magnificent harbour, imposing multi-storeyed buildings, crowded thoroughfares, busy markets, shopping centres and beautiful tourist spots. The British acquired Mumbai from the Portuguese in 1665 and handed it over to the East India Company in 1671 for a handsome annual rent of Sterling Pounds 10 in Gold! Later, these seven islands were joined together by causeways and bridges in 1862. After breakfast, you are driven to the airport for your early morning flight to Ahmedabad. Arrive in Ahmedabad where you are met and driven to your hotel. Founded in the 15th century by Ahmed Shah, the independent Sultan of Gujarat, Ahmedabad is now the industrial capital of the State and a graceful blend of old and new. After breakfast you will visit the Calico Museum, a world famous textile museum. Afterwards we will visit the area around Rani-no-Hajiro, a small mosque in the old part of the city. The Calico Museum of Textiles is regarded as one among the foremost textile museums in the world and an important Indian institution. Its outstanding collection of Indian fabrics exemplifies handicraft textiles spanning five centuries, attracting even international research scholars. Most significantly, it has become a major reference area for our surviving handicraftsmen and also for the Indian machine-textile industry. Today you begin early morning and drive to Bhuj. Bhujodi: A small town just 8 km southeast of Bhuj, Bhujodi is a major textile center of Kutch, with the vast majority of the 1200 inhabitants involved in textile handicraft production. Here you can meet weavers, tie-dye artists and block printers, most of who belong to the Vankar community. Enjoy watching artisans work. After breakfast at hotel, you will drive to Kala Raksha, located in Sumrasar Sheikh Village in Kutch. Drive onward to the campus site of Kala Raksha workshops, Vidyalaya, approximately 2 hours from the museum. Kala Raksha Trust, a grassroots social enterprise, is dedicated to preservation of traditional arts. Envision this broadly, as holistic encouraging of the creative capacity of the artist. Comprising artisans, community members, and experts in the fields of art, design and museums, Kala Raksha was founded on artisan intiative in 1993 in the desert region Kutch, in India. Uniquely committed to documenting existing traditions, the Trust maintains a collection of heirloom textiles housed as a local Museum. Artisans participated in establishing this Museum. Thus it embodies a simple but revolutionary concept: involve people in presenting their own cultures. Kala Raksha Centre is located in Sumrasar Sheikh, 25 km north of Bhuj. Here the museum, production unit, shop and guest house inhabit structures that adapt traditional architecture to contemporary function. A model for community development, the Center is locally managed and operates with solar power. The Vidhyalaya Campus rests on eight acres of land near Tunda Vandh, in Mundra Taluka, Kutch. The campus includes a guest house with four double rooms, a large courtyard, classroom, office and computer lab. Studios for weaving, block printing and dyeing are constructed in traditional style with stone and lime mortar, and antique wood and stone elements. These structures have revived languishing eco-friendly techniques while contributing to the beautiful, inviting atmosphere of the rural campus. Optional 1, 2 and 5 day workshops without room and board are also available. Discussion: Illustrated lecture on concept and techniques. Examination of examples, with focus on discovering the relevance of patterns to lifestyle. Activity: Begin to execute project. Participants discuss what they have learned about life and art in rural Kutch. Exhibition and sharing. Celebrate with Kala Raksha artisans- an afternoon of song, and craft sales. Drive onward to Hodka and check into your hotel. Full day visit to Banni (North Bhuj). Meet Rabaris known for their distinctive craft. Amidst the Desert land of infinite dimensions, are suspended, quaint little villages. Here you will come across master craft people’ exposing their traditional art, turning our master pieces every day. Their ornaments, clothes, utensils, everything they use – will make you feel as if you have stepped into lifestyle museum leaving you spellbound. After breakfast drive to Bhuj. Today discover the town of Anjar. Take an early morning game safari at 6:30AM which lasts for 2 plus hours. After brunch, you discover cultural Patan and Modhera. Patan is one of the important fortified towns of Gujarat, situated on the banks of the River Saraswati. It was founded in 746 AD by the Chavda king, Vanraj Chavda. The city also served as the capital of Gujarat for about 600 years. The city is very famous for its Patola fabric sarees the world over. The fabric is the specialty of the Patan and prime examples of the traditional art. Each saree is truly a masterpiece and takes approximately 4 to 6 months to be completed. You will be driven to the airport for your departure flight to Mumbai. –	Transport will use as per the program only. –	Items of personal nature like telecom charges, laundry, beverage, tips, camera fee and gratuities. –	Any other services not mentioned above.